Simone Dinnerstein: J. S. Bach - Goldberg Variations :: TicketServices.gr " // + "
Α passionate musician who has climbed to the top of the classical music charts, is coming to the stage of Summer Nostos Festival to present a unique piano concert. American pianist Simone Dinnerstein, a passionate musician who has climbed to the top of the classical music charts, is coming to the stage of Summer Nostos Festival to present a unique piano concert. Dinnerstein first attracted attention in 2007 with her self-produced recording of BachΆs Goldberg Variations. It was a remarkable success, reaching No.1 on the U.S. Billboard Classical Chart, and established DinnersteinΆs distinctive and original approach. The New York Times called her “a unique voice in the forest of Bach interpretation”. Her career has since taken her around the world from Brazil to Japan and she has made a further eight albums with repertoire from Beethoven to Ravel. 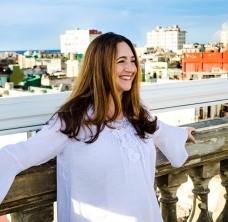 In 2017 Dinnerstein released the album Mozart in Havana, recorded in Cuba with the Havana Lyceum Orchestra. She went on to bring the orchestra to the United States for their first ever American tour. In the same year, Dinnerstein premiered a piano concerto written for her by Philip Glass and co-commissioned by twelve orchestras. DinnersteinΆs performance schedule has taken her around the world: From Carnegie Hall's Weill Recital Hall, to festivals such as the Aspen and performances with the Vienna Symphony Orchestra, Dresden Philharmonic, New York Philharmonic and the Tokyo Symphony, among many others. Dinnerstein is also committed to the diffusion of music education. She plays concerts for the Piatigorsky Foundation, an organization dedicated to bringing classical music to non-traditional venues. Under their auspices she gave the first classical music performance in the Louisiana state prison system at the Avoyelles Correctional Center. She also runs her own concert series supporting music education in public schools.